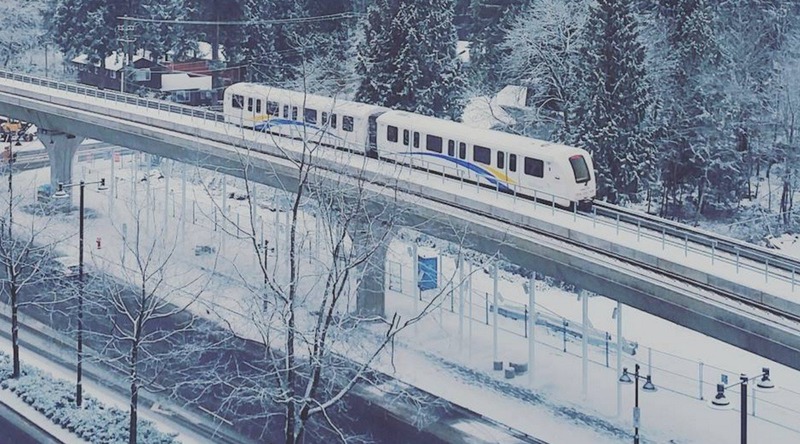 The first major snowfall of the winter season is causing havoc across Metro Vancouver. Heavy snowfall throughout the afternoon has resulted in traffic congestion on the roads and significant delays to SkyTrain service. Both the Expo Line and Millennium Line are experiencing delays, with a track switch issue leading to a shutdown of Expo Line service between Braid Station and Lougheed Town Centre Station. A bus bridge shuttle is in place between the affected stations. Train door problems due to ice and snow buildup and track intrusion alarms at station platforms, triggered by the accumulating snow, are also highly problematic at this time. TransLink is responding to these issues by switching off the automatic track intrusion alarms and working as quickly as possible to assemble the required SkyTrain attendants to manually control all trains. Severe service disruptions on the Expo Line and Millennium Line began at approximately 2 pm. At the time, the system was already experiencing higher-than-normal ridership due to the weather conditions. There are no service impacts to the Canada Line at this time. Many bus routes have been impacted by snow-related issues and accidents. For instance, TransLink is reporting of delays of up to 50 minutes on the No. 25 UBC/Brentwood route and up to 90 minutes on the 99 B-Line. TransLink is also using regular buses instead of the usual trolley buses for some Vancouver routes; trolleys are particularly having trouble in the Vancouver Westside. Snow began falling in Metro Vancouver at approximately noon, and a snowfall warning was issued by Environment Canada shortly before 2 pm. An updated weather warning at 4:06 pm stated 3 cm to 5 cm has already accumulated in the region, and a further 2 cm to 4 cm can be expected throughout the evening. Drivers who need to use their vehicles are urged to exercise caution and maneuver slowly. Any customers travelling in either direction will be required to switch trains at Columbia station. The bus bridge has been cancelled due to poor road conditions.